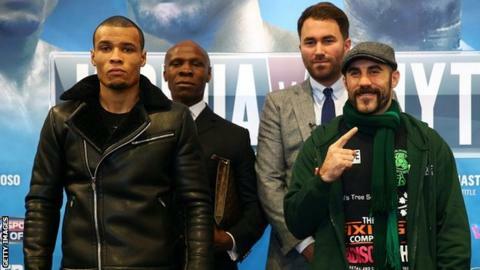 Chris Eubank Jr says Gary O'Sullivan is "in too deep" ahead of their middleweight grudge match at London's O2 Arena on Saturday. Irishman O'Sullivan has been goading Eubank Jr for years but the Englishman believes his rival will be consumed by pressure when they finally fight. The bout is a final eliminator for the WBA 'world' middleweight title. "The guy has called me every single name under the sun but now he's gone into his shell," said Eubank Jr.
"When we were finally in a room together, he had nothing to say. It was embarrassing and I kind of felt sorry for him, I think he realised then what he has got himself into. But he's going to pay for his words. He's a pretender and he's going to get punished. "I'll be very surprised if he can go eight rounds. If he tries to use this amazing power that everyone in his team has been talking about and tries to steamroller me, he's going to walk onto big punches and he's going to get stopped. "As far as I am concerned I am a good guy. It just so happens that the people I fight don't seem to like me very much." Eubank Jr, 26, has won both his fights since losing to Billy Joe Saunders last year and has 20 wins from 21 pro encounters; O'Sullivan, 31, also lost to Saunders in 2013 and has 22 wins from 23. Eubank Jr's clash with O'Sullivan is on the undercard of the British heavyweight title fight between Anthony Joshua and Dillian Whyte. Kevin Mitchell is also on the bill, fighting unbeaten Venezuelan Ismael Barroso, with the winner set to face Manchester's WBA lightweight champion Anthony Crolla. Last time out, Essex boxer Mitchell, 31, was incredibly brave despite losing to WBC champion Jorge Linares. Other fights on the bill include Liverpool's Tony Bellew facing Mateusz Masternak for the vacant European cruiserweight title, while Olympic champion Luke Campbell continues his progress through the lightweight ranks. Former world champion Paulie Malignaggi, who is American of Italian descent, challenges Italy's Antonio Moscatiello for the European welterweight title.